It might not be the most glamorous political appointment, but serving on CPS Energy’s Citizen’s Advisory Committee offers a fascinating glimpse into one of the largest and most complex companies in San Antonio. The 15 volunteers who serve on the CAC meet once a month to learn about, question and offer guidance to CPS Energy and its Board of Trustees on a range of issues, including rate increase requests, expanding infrastructure and generation decisions. CAC members even weighed in when it came time to choose a new CEO. “When people complain, I say, ‘Involve yourself,’” said Joe Shockney, the current CAC chairman. A former energy executive, Shockney was appointed by then-District Councilman Reed Williams — but he emphasized that an energy background isn’t necessary. “You just have to have a strong interest in understanding what CPS Energy does,” he said. Those that do — or think they might — have an opportunity to serve. The committee has several vacancies right now. Ten members are appointed by San Antonio City Council, and serve as liaisons to their council members. Districts 2, 5 and 7 have vacancies right now, said John Leal, senior manager of local government relations. 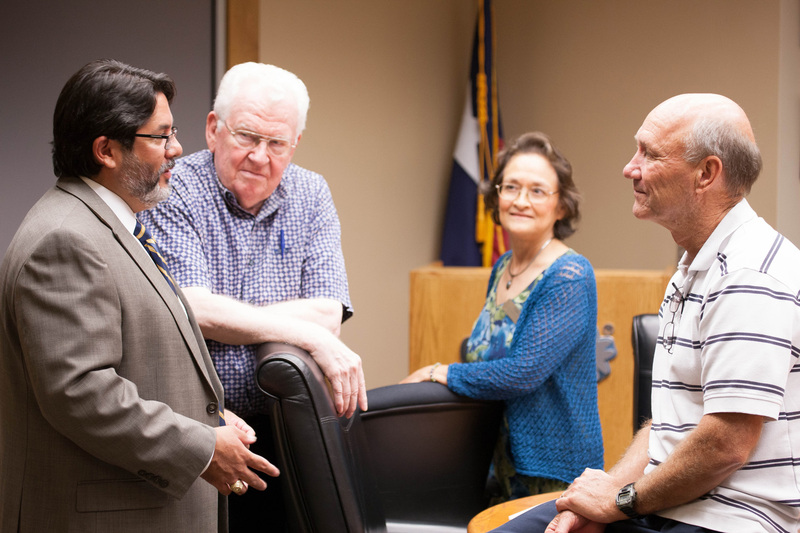 John Leal, CPS Energy briefs CAC Chair Joe Shockney, Esther DeLeon District 1, and Michael Moczygemba Member at Large. It’s crucial to fill those seats, given that CPS Energy revenues make up fully one-third of the city’s general fund budget, and council members are charged with approving (or not) rate increase requests from the utility. “If a CPS Energy residential customer is interested in learning more about the company, there certainly is an opportunity with the CAC to give back to your community,” said Rudy Garza, vice president of external relations. Another five seats are considered “at-large,” and are chosen from those who submit applications directly to CPS Energy. They’re selected by the CAC and ratified by the Board of Trustees. Trip Worden wraps up his third two-year term as an at-large member in September and will step down. The committee was instrumental, in fact, in changing the way CPS Energy sites new substations, which can often be a contentious process. “They use that process to this day,” said Shockney. Worden emphasized that utility expertise is not required. “You just need a willingness to hear what other people say, people you might not agree with, and then together make decisions,” he said. A good committee member should also have a good rapport with their council member, he added. The committee meets once a month, and members spend some individual time familiarizing themselves with utility information.